Competitions at this event are meant for decorators and twisters. The main competition's theme is ''wedding'' - a wedding table (presented below). All the pictures taken at the event are the property of the event organizers and can be used for further promotion. This Hat you will wear at the Gala dinner on Sunday evening. 1. Only the ones who applied for all seminar courses may compete (all three days). 2. One must apply for the competition at the registration for the event. 3. The number of contestants is not limited. 4. Only one person may compete. 5. Only Qualatex balloons are allowed to be used when competing. 7. The hat can be made in hotel room and bring it on gala. 8. Three awards will be given (first, second and third place). 9. A special jury will evaluate the figures and their decision shall be final without the possibility of a complaint. During the event we will organize a competition in making any balloon figure. 3. Only one person may compete. 4. Only Qualatex balloons are allowed to be used when competing. 5. This competition is limited to 12 minutes. 6. All the contestants shall compete at the same time and in front of other event participants. 7. Three awards will be given (first, second and third place). 8. A special jury will evaluate the figures and their decision shall be final without the possibility of a complaint. The exact time of the competition will be published subsequently. You can join a competition called ''Frame sculpture'' with an open theme. 3. The number of competitors is limited to 10. 4. Only one person can compete, assistants are allowed. 5. Only Qualatex balloons are allowed. 7. Sculpture can be done in a hotel room or other areas during the event. - 10 points The sculpture with an original theme. - 15 points Techinical solutions of the sculpture. - 10 points The sculpture must be a great achievement - visual effect is important! - 10 points The colors used in the sculpures must match. - 10 points The jury will be searching for innovative designs and ideas used. - 10 points The jury will be evaluating the commercial value of the sculpture. The winner will be pronounced at the Gala dinner on Sunday. Large sculpture competition with a theme called : Wedding table. Imagine a very demanding client who wish a special decoration at the wedding. The celebration will be held at the hotel Toplice on 16th of November. Your table must be ready until 5:00 pm on Saturday , when the guests will soon be coming in. 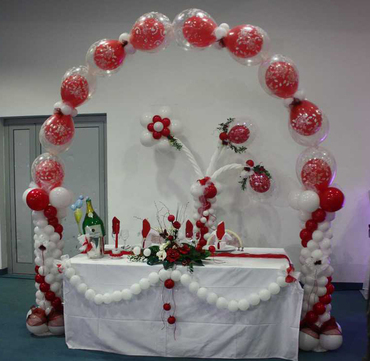 You can decide if you wish to include a heart, columns, arches, table arrangements or helium balloons. It is up to you to come up with an unforgettable wedding table. Your piece must not exceed the provided space of 3m x 3m x 3m. For taking part in this competition contact. Renata Fric +386 781 60 550 or write to renata@magic.si. The material used in this competition will be sponsored by Pioneer - Qualatex. The decoration must be made out of 80% balloons and only Qualatex balloons can be used. For the rest, you are free to use other materials. Metal stands, wires of any kinds and sizes, plates etc... will be provided from us. After you apply for the competition, you will receive a Material form, so you can complete it and send it back until 20st of October 2019. Different electric inflators, sizers, helium, hi float, dacron and nylon lines, tapes,... and everything you need to create your decoration will be provided for you. Just bring your scissors and hand pump. The Terme Čatež Hotel will provide the additional decoration considering cloth, plates and cutlery. ​You will be asked about it before you start and before you finish, if you need anything more. 9You will be assigned a decoration space in a size of a 3 meter cube. You will be given a table and two chairs. 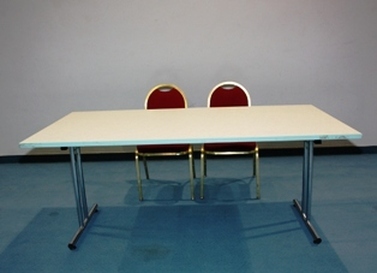 The table size is 90 x 180 cm. No damaging of the inventory is allowed. The final decoration should be visible from all sides. The competition begins on Saturday 16th of November at 9:00 am and the wedding table decoration must be finished until 5:00 pm that day. The decoration and its elements must be made within the space assigned by the organizer. The number of competitors is limited to 10. One competition can participate only 10 delegates who are registrated for event. You will be asked for the name of the competition and the name of the leader (normaly only one name or name of the group or the company). By this name we will announce your work at the Gala dinner on Sunday evening. Awords will be given at that time too. No attaching or fixing to the wall and ceiling is permitted. The decoration itself should be portable in case of a need to move it to another location. All the decoration's elements must last until Monday 18th of November (if you intend to use helium also apply hi float). The ompetitions will be showed to the public after the event. Only Qualatex balloons need to be used! The decoration must consist of 80 % balloons. If you require helium or blowing devices also contact Renata Fric CBA until 1st of October 2019 by writing to event@magic.si. Each competition space will be marked in the event's big hall. The competition piece will be moved on Monday at 17-00 to the hotel place to be shown to the public. So please help to move it. You can take all your products used in the competition home and your competition piece will be presented as it is or not be shown. The companies Pioneer and Magic hold the right to all photographs and can willingly use them in their publications (websites, Images magazine, ect.). Along the picture, your address or the name of the decorator will also be published. The judges will consist of the representatives of the companies Pioneer, Magic d.o.o. and Qualatex instructors. Each decoration will be evaluated based on a special criterion system created for this competition. The judges will stick to this system and therefore it is important that you do too. The decoration must not exceed the assigned dimensions ( 3mx3mx3m). Only Qualatex balloons can be used. The decoration must be made in the time given. The balloons are the most important part of the decoration. Only the ones who are registered for the event may participate in this competition. The competition is limited to 6 contestants per decoration. - 10 points The decoration must be adjusted to the theme ''wedding''. - 15 points Technical solutions of the decoration. - 10 points The decoration has to be an outstanding achievement - visual effect is important. - 10 points The whole decoration has to match in colors. - 10 points Originality of the decoration. - 10 points The judges will be looking for innovative elements and details. - 10 points The judges will evaluate the commercial value of the decoration. A complaint to the given prizes is not possible. The winner will be announced at the Gala dinner on Sunday.